In Vienna praise of Benucci’s qualities was effusive. An anonymous pamphlet printed in 1790 extolled his dignified stage manner, praising that ‘only Benucci … knows how to elevate the plot with his acting and singing’. Exploiting Benucci’s capabilities was evidently on Mozart’s mind when composing the role of Guglielmo in Così fan tutte (26 January 1790). Da Ponte’s tale of two men who accept a wager to dress up as Albanians in order to test the fidelity of each other’s girlfriends (only to end up disillusioned by their varying rates of success) was intended initially for Salieri, who abandoned work on setting it to music. There is some evidence Mozart took considerable trouble over creating the large-scale aria ‘Rivolgete a lui lo sguardo’ (K584) for Guglielmo’s comic catalogue of the Albanians’ attractive merits: his boasts include references to mythical and historical figures including Narcissus, Cyclops, Croesus and Mark Antony, in a long list that alludes to Aesop’s fables and Boiardo’s fifteenth-century epic Orlando innamorato. Moreover, Guglielmo boasts of their skills in dancing and singing, and that he and his Albanian compatriot are without equal from Canada to Vienna; he insinuates that they also possess impressive physical attributes, which sends the sisters scurrying away in embarrassment. 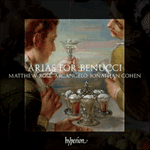 Notwithstanding the efforts Mozart went to in tailoring this showpiece including oboes, bassoons, trumpets and timpani for Benucci’s talents, it seems he evaluated that the lengthy catalogue aria was unsuitable for the dramatic context of the scene. The big aria was removed during the compositional process and replaced with the more concise and functional ‘Non siate ritrosi’, in which Guglielmo’s innuendo about the size of the Albanians’ moustaches quickly breaks down into the laughing trio for the disguised men and their cynical mentor Don Alfonso. Quel che il labbro dir non sa. Son di bronzo i suoi desiri. Abbiam poi che alcun non sa. my idol, have pity, have pity. that which my lips cannot express. his desires are hard and cold like bronze. would be a buffoon compared to us. so delicate, so slender are our feet. which no one knows about.